I have an excellent reason for never having picked up an Alice Waters cookbook before. I once saw an episode of Sundance's Iconoclast with Alice Waters and Mikhail Baryshnikov. Alice Waters annoyed me. A lot. There you have it. Of course, I sometimes come across recipes credited to her that seem right, right up my alley. After having that happen enough times, I figured I might be missing something. I found a copy of The Art of Simple Food at the library last week and have been engrossed in it ever since. 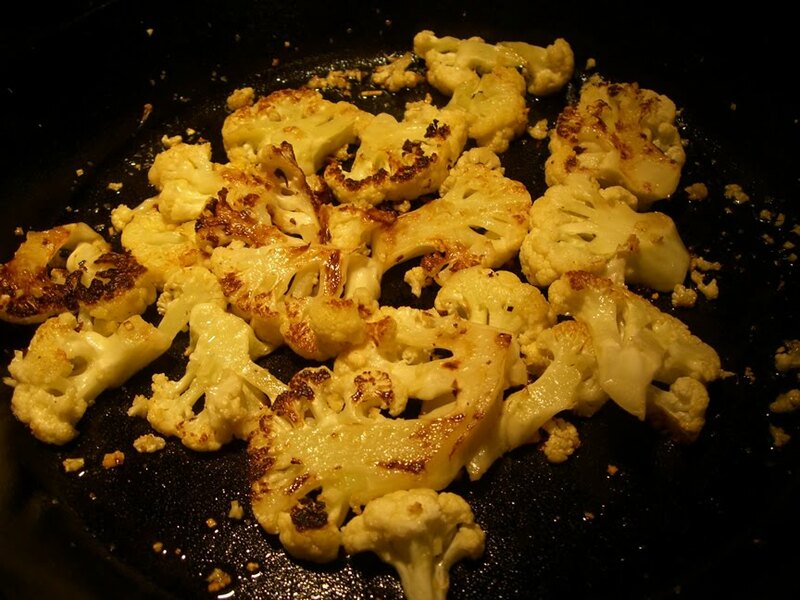 The first recipe I tried was for Sauteed Cauliflower. The only ways I've cooked cauliflower in the past was as a simple puree or mash. I've considered roasting it (my favorite way to cook any vegetable) but hadn't gotten around to it. A saute sounded very simple and potentially very good. And it is. Remove the leaves from the cauliflower. Remove the base of the stem with a sharp knife. 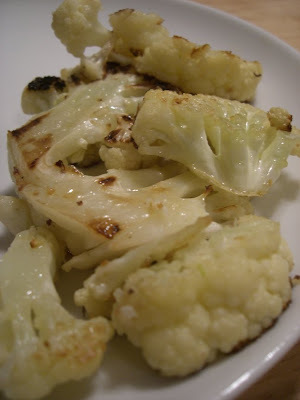 From the top down, cut the cauliflower into 1/4 inch slices. Heat olive oil in a heavy bottomed pan over medium-high heat. When the oil is shimmering but not smoking, add the cauliflower and salt. Let the cauliflower sit until it begins to brown. Turn or toss, cooking until the cauliflower is tender, about 7 minutes total. In the last minute or two of cooking, add minced garlic and toss. When finished, season with additional salt if needed and a drizzle of extra-virgin olive oil. That's it. It's lovely. She offers a number of variations as well including adding parsley, chopped salt cured anchovies and capers, hot chili flakes and coarsely chopped olives and using it to dress pasta. I put it alongside seared pork chops and beets. That looks good! I have never been a cauliflower fan but it seems like it has potential, so I've been experimenting. So far, tossed with smoked paprika and a bit of oil then roasted has been the best. Am going to try curry and also this one!